In stock 188 pcs. Also available in our walk-in store. A small, well designed day pack. Ex-Dutch army issue and used. These are made so well that we'd be tempted to give a lifelong guarantee. 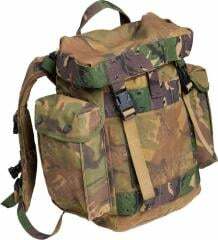 In short: If you can get past the camo, this is the perfect little daypack for an unbeatable price/quality ratio! Like a good life, it's well compartmentalised for convenience and even fits a laptop inside. No breaky breaky, this pack is made super mega well. 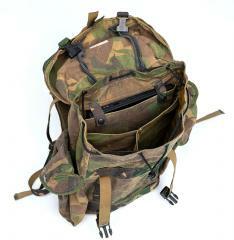 Padded, uniquely designed shoulder straps with good room for adjustment. A place for a name tag. Main comparment divided into three parts. The dividers can be cut off if necessary, but they really help organizing your stuff. Against the back, a flat compartment for foam padding (likely not included). Any piece of foam will do. The compartment can also be used for storing documents. Side pouches with snap closure. These are open on the backside - useful for long objects. The lid is closed with quick release buckles, and features a flat compartment inside. Thanks to the good adjustments, the pack can be overpacked. ALICE- and M1910- (and MOLLE- ) compatible attachment points on the front and lid. Measurements of the main compartment about 28 x 38 x 14 cm. Don't take these too literally, though. Made of durable, military grade DPM-camouflaged nylon material, which most likely is IRR-treated and at least water repellent. In used, but in good serviceable shape. The best kind of surplus: quite a modern design and made to last. The rucksack I received looks almost identical to the one pictured on the Varusteleka’s website, maybe a little less faded. These are very well-built packs. The pack I received also had the inside divider removed somewhere along the way. The straps on these are well padded and at first fit it appears quite comfortable. These are not large packs, but should make an excellent day pack.